Whether you’re interested in Honda flagship, tech-savvy vehicles like the Honda Accord, or even one of Honda’s spacious classics such as the Honda Pilot, Honda of Greeley in Greeley, CO has respectable Certified Pre-Owned Honda vehicles on our lot Explore the options below. It's so easy at Honda of Greeley!2016 Honda Civic EX-T w/Honda Sensing 31/42 City/Highway MPG Lunar Silver Metallic EX-T FWD 1.5L I-4 DI DOHC Turbocharged CVTHonda CERTIFIED, Civic EX-T w/Honda Sensing, 1.5L I-4 DI DOHC Turbocharged, Black/Gray Cloth, 4-Wheel Disc Brakes, 8 Speakers, Automatic temperature control, Distance pacing cruise control: Adaptive Cruise Control with Low-Speed Follow, Electronic Stability Control, Emergency communication system: HondaLink Assist, Four wheel independent suspension, Front dual zone A/C, Front fog lights, Fully automatic headlights, Power moonroof, Radio: 180-Watt AM/FM/HD/SiriusXM Audio System, Reclining Heated Front Bucket Seats, Security system, Split folding rear seat, Spoiler, Steering wheel mounted audio controls, Tachometer, Telescoping steering wheel, Tilt steering wheel, Trip computer.All used car prices include dealer and handling charge of $498. 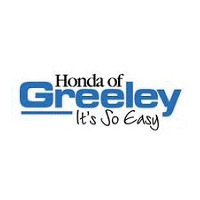 Come to www.HondaofGreeley.com To See Our Specials!!! Call us at 970-506-2791 For help with anything we offer.Awards:* 2016 IIHS Top Safety Pick+ (When equipped with honda sensing) * NACTOY 2016 North American Car of the Year * 2016 KBB.com Brand Image Awards2016 Kelley Blue Book Brand Image Awards are based on the Brand Watch(tm) study from Kelley Blue Book Market Intelligence. Award calculated among non-luxury shoppers. For more information, visit www.kbb.com. Kelley Blue Book is a registered trademark of Kelley Blue Book Co., Inc. It's so easy at Honda of Greeley!2017 Honda Civic Sport Touring 30/36 City/Highway MPG Polished Metal Metallic Sport Touring FWD 1.5L I4 DOHC 16V CVTSp Trg Leather.Odometer is 11274 miles below market average!All used car prices include dealer and handling charge of $498. Come to www.HondaofGreeley.com To See Our Specials!!! Call us at 970-506-2791 For help with anything we offer.Awards:* 2017 KBB.com Brand Image Awards * 2017 KBB.com 10 Most Awarded Brands2016 Kelley Blue Book Brand Image Awards are based on the Brand Watch(tm) study from Kelley Blue Book Market Intelligence. Award calculated among non-luxury shoppers. For more information, visit www.kbb.com. Kelley Blue Book is a registered trademark of Kelley Blue Book Co., Inc.